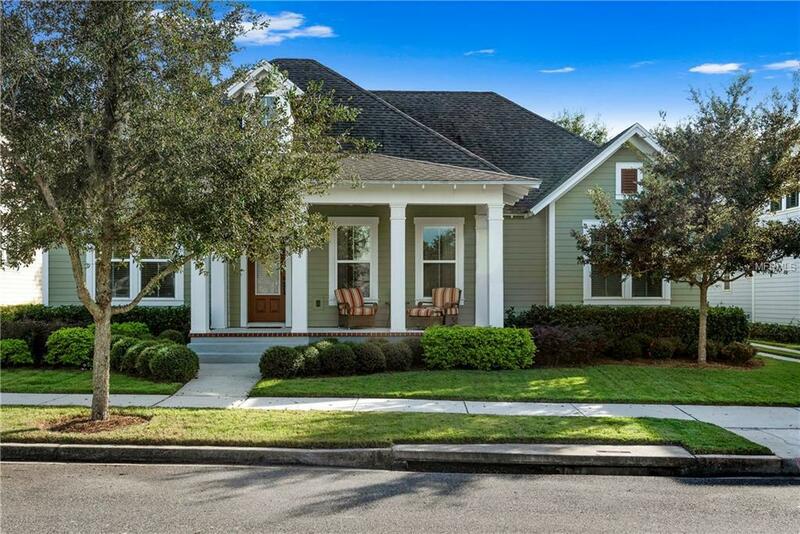 Located in the Certified Green Development of Oakland Park, this beautiful David Weekley home exudes classic bungalow charm. An inviting porch with room to relax welcomes you to the front door which opens to a soft entry foyer. To the left there is a study/home office with abundant natural light and a spacious dining room to the right. As you proceed through the family room area on hand-scraped hickory wood floors the extension of the family room area opens to a large kitchen with an oversized island & bar seating. The kitchen comes equipped with solid wood maple cabinets, granite countertops, & stainless steel appliances. The functionally desirable floorplan was wonderfully designed with flexibility in mind. The 10 ceilings, 9 doors, & extensive millwork show exquisite craftsmanship. The master bedroom is tucked away in the back of the home and has views of the private backyard. It features a tray ceiling, generous walk-in closet and a master bathroom with a spacious master shower with double shower heads. The lush backyard has a built-in summer kitchen including a sink, grill & refrigerator as well as a built-in fire pit. This is the perfect place for entertaining guests or relaxing with family. This home with an oversized three-car garage sits on one of the largest lots in the neighborhood within a community that offers multiple amenities such as parks, playgrounds, a community garden, pool, and clubhouse. Enjoy being close to the West Orange Trail and all of the events this community has to offer.